Notice, though, what Fraser consumes: meat, vegetables, and fruit. Notice, too, what Fraser doesn’t consume: junk food and soft drinks. So, even if the famed Cross-Fitter doesn’t follow a strict diet, he follows a plan nonetheless, which is to simply eat healthy. And for the most part, that’s good enough. Following Fraser’s advice will mean a steady stream of vitamins and minerals, which are nutrients that help the body function optimally. If Fraser is the man at CrossFit, then Cristiano Ronaldo holds that distinction in football. And like Fraser, the Juventus star eats healthy. He focuses on getting in a lot of protein, with fish being his favourite source, as he shared in an interview with FourFourTwo. And other athletes need to take a page out of the Ronaldo diet because protein is the building block of muscle growth and is essential for muscle recovery. In other words, protein makes muscles big, strong, capable and helps maintain muscle mass as you age. The Djoker also advises against drinking ice water. As Djokovic himself explains, drinking ice water forces the body to send additional blood to the digestive system just to heat the water to 98.6 degrees. This, in turn, slows down digestion, and worse, diverts blood away from the muscles — something cataclysmic to athletes. Mo Farah is one of the best distance runners in the world, but even he admits to getting bored with the diet demands of being an elite athlete. 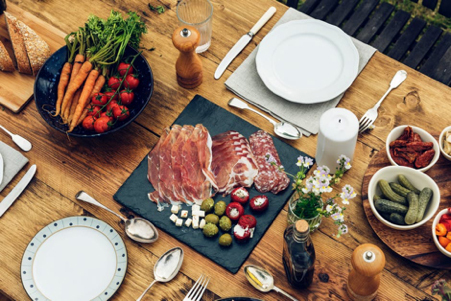 He admitted it to BBC Good Food that it is the “price you pay for this sporting life.” Fact is, getting good nutrition entails plenty of discipline and sacrifices along the way. But if Farah got used to such a disciplined way of life, there’s no reason for other athletes to do the same. In this regard, distance runners should make it a point to complement their diet with hard training, like the four-week plan we recommended here. Said plan includes recommendations on nutrition, too, underscoring its importance. The importance of nutrition to athletic excellence can no longer be understated. It goes hand-in-hand with talent and training, and it is an indispensable part of the equation. The challenge then is how to ensure good nutrition. The tips outlined here are a good start to that end, and any athlete will be best served keeping each one in mind. 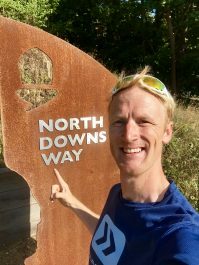 This year I chose to enter the 100 miler, NDW100 again. This time to better my previous time of 23h04m. 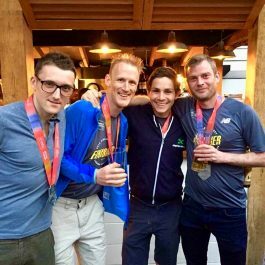 The forecast was for a hot weekend and I would be tackling this event with 3 other members who were new to this distance from my running club, Clapham Chasers.I felt well rehursed for this event having completed it only a year earlier having doubled it up with another hundred, Lakeland 100 the weekend before. I was psyched and looking forward to taking this challenge on again. There were going to be a number of Clapham Chasers out on the course giving support. I had opted to not use any pacers in the later stages, taking this challenge on myself. It was an extremely hot day and I knew hydration would be key to any success. I took advantage of a fairly quick pace early on in cooler conditions and flatter ground. I was hoping to complete the route in under 21 hours this time. I was pleased with my start and was eating and drinking just fine to keep my hydration levels up. As soon as I hit the hills of St Martha’s Mount and Box Hill i was jumping between 10th and 14th position, and I took some gels to help with the ascents. These gels had caffeine in and I know from previous experience that there was a chance these would not sit well with my stomach. It is a shame to say that this was the case again as my body stopped absorbing any fluids I was putting in. The fluids built up in my stomach and swashed around like a hot water bottle before making me sick. This sickness meant I was also not taking in any food and as a result after 34 miles of running I came to a halt! I literally hit empty and my mouth was dry from dehydration. It then took me a huge effort for me to make it to 42 miles where the next aid station was. When I arrived there, I told them what had happened, I had no energy to stand and I said I would be spending some time there to try and eat something and absorb some fluids. I was there for about 1h20m and still didn’t feel any better despite lying down. Still I got the show on the road and made it to half way very slowly where I had made the easiest decision to not continue. But is was a great day for the 3 other Chasers who were well supported. Matt, a great Marathon Runner and 100km Runner won the event after a perfectly executed race. 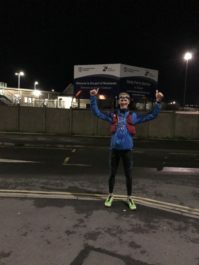 Alex managed to get under the 24 hours with a time of 22h52m and Frankie, despite falling over at half way managed to duck under the 25 hour mark with a 24h59m time. What was special was that having dropped out at half way, I was able to hitch a lift to join the support team of these runners. That is all for now, I am sure there will be another ultra at some point for me, but I am going to take a break for now. I was really pleased with my effort and love this event. I was mostly chuffed to see 3 new Chasers join the Club Spreadsheet I keep of 100m+ Ultras. There are now 21 members of the club. 2.4 mile swim, 112 mile bike followed by a 26.2 mile Marathon Run. 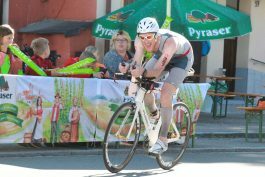 These events take a lot of preparation and these days you have to enter the triathlon events like this a year in advance. I had full intentions to train and tackle this event with an aim to better my time from completing the event 5 years before. The training didn’t come together in the run up having only been to Shepperton Lake once, ridden a single road ride to Brighton and back in April’s freezing ‘Beast from the East’ conditions and then cycling to Paris with the Clapham Chasers the week before Roth. The weather was so nice on the trip to Paris, I decided to ride back to London again afterwards. My running had stopped after the hot London Marathon where I ran 3h18m in non idyllic conditions. 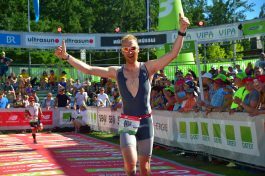 Having said all that, I was psyched to head back out to Germany and give Roth my all and relied on the fact that I had done the event a couple of times before. I was to be joined by another 2 Chasers, Cat and Henry who ere also taking part. The journey out there was great, Germany had just been knocked out of the World Cup at the group stages which made for some interesting travelling. I touched base with an old friend over there who I had not see since a bothy adventure 8 years before. I stayed with them and we watched the England match. The following day I headed over to Roth in my hire car and set up camp in the field next to the Swim Start. I had big ambitions when I Registered for Roth a year before and unfortunately, that put me in the second wave start behind the Pros! I was not looking forward to this since swimming is my weakest discipline of the three and I was well out of practice. Waves of 200 were set off in 5 minute intervals. The morning was stunning and made for super racing conditions, not too hot. 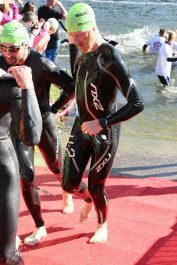 The swim went ok, I was caught by people in the 3 waves behind me! The swim took me 1h14m. I was pleased to get it over an start on the bike. My transition through and on to the bike was speedy in little over 2 minutes. I love riding my bike and the first lap of 2 went well, I wasn’t overtaking many as I was an earlier starter compared to last time. I found it tough going on the second lap where the riding felt more of a struggle and I seemed to be going backwards, even on the downhill! I thought it was due to a loss of power in my legs, maybe London to Paris and back was taking its toll. There was a bit of a squeak developing which I think too much of and my lower back was starting to really hurt. It wasn’t until after the event and I collected my bike form transition that I realised my wheel had dislodged (maybe as a result of the powering up hill) and had been rubbing the tyre against my rear seat stay causing a large area of carbon to be warn away. Anyway, back to the race and the relief of getting off of the bike after 5h26m of riding, 25m slower than I had previously gone. With my aching back I was pleased to be vertical and on the run. It still felt quite cool as the first part of the run was in the shade. I started off comfortable and pleasantly surprised at the initial Km times. I knew Henry was starting about half an hour behind me and with his fast biking ability and my slower than usual bike, i knew it would not be long before I saw him on the hairpin run course. I saw Henry at the 3 opportunities looking strong going on the opposite direction. I was calculating that I was opening up a wider gap between us but also knew that it would be close having taken in to account our different start times. 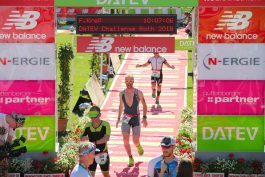 I enjoyed the run and the amazing stadium finish that Challenge put on to finish the marathon in 3h37m and overall time of 10h22m. It was then a waiting game to see Henry come through. I managed a shower and a massage in the half hour wait before Henry finished. Henry slowed up a bit on the run but was able to hold on to a 10h19m finish, just 3 minutes quicker than mine on his first triathlon of this length. I felt great to have finished and wasn’t too trashed. This time I was able to and drink copious glasses of Erdinger being given to the finishers and then enjoy the final finishers coming through in the dark to complete there race. This made for an amazing atmosphere for those who had been out for a long long time on the course. I am not in any great rush to follow up with another Ironman anytime soon. I enjoyed this Challenge and even more so having been there twice before. Onwards to the next challenge…. Sunday 22nd April saw the streets of London again packed full of supporters to cheer on the runners taking part in the annual London Marathon. From a participation point of view, this is the best race on the planet for support. This was going to be my 6th London Marathon,and I secured my place by running a qualifying Good For Age time (below 3h05m) in 2016 of 3h00m02s. The training had gone well with long runs, together with track and tempo sessions to mix it up. I had also run the Hampton Court and Brighton Half Marathons in the build up where I clocked a 1h21m in both. As the big day approached, the forecast was suggesting that the day would be a hot one. It had been hot all week, prompting London Marathon organisers to contact all their runners to come prepared. 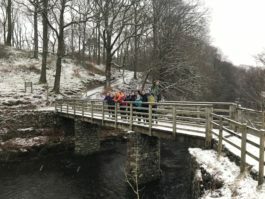 The weather was polar opposite to what we had done all our training in, for example, the Beast from the East which brought in freezing conditions. 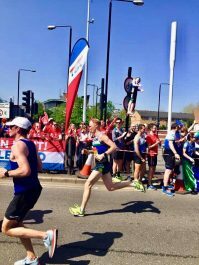 The advice from London Marathon was to adapt our targets accordingly, due to the heat. Now, I felt I was close to 2h50m shape from all my training, yet I still had not broken 3 hours for a marathon. After a great night’s sleep, I had my porridge and set off towards the start. I set off conservatively, knowing it was going to get hot and uncomfortable. The first 5 km are down hill and I was able to run along with some other runners from my club. The pace felt OK, but I could feel a growing discomfort as I continued to run. The day turned out to be London Marathon’s hottest day on record, with temperatures hitting 23.5 degrees! 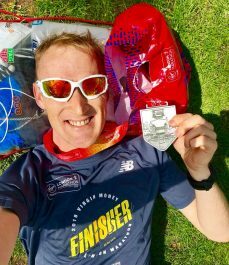 I was not adverse to running in the heat, having taken on the Marathon Des Sables in 2015, and I would never complain about a bit of English sunshine, but to race hard in the heat chasing personal bests is another thing. I hit half way in 1h29m with my target in mind to achieve the sub 3hr, but it didn’t feel as comfortable as I would have liked. I was taking sips of water at each water station to maintain enough hydration from all the sweat. I carried salt sticks to help top up my levels en route. One amazing part of being a member of Clapham Chasers is that there are 50/60 Chasers who head down to a Cheer spot shortly after 14 miles in Westferry. This offered a great lift of energy and a brief moment to forget about the heat we were all suffering from. I chose to ditch my hat here as the sweat mixing with my P20 sun protection was going into my eyes and making them sting. out in their masses to support the event. I kept a good pace going round the Isle of Dogs where in the past the support thins out. Not this year. I think those who were watching were in such awe of runners tackling the conditions that they kept the electrifying support up. Upon exiting Docklands, just before the 17 mile marker is where I felt an acute blister develop on the instep of my left foot. Every step I took, I could feel it force itself bigger and there was nothing that I could do. This knocked my morale as my pace by this point was already dropping off the 3 hour target I had set myself. London Marathon the week before had announced that the Good For Age time for guys below 40 was shifting from 3h05m to 3h00m. This shift linked my qualifying standard to my PB. 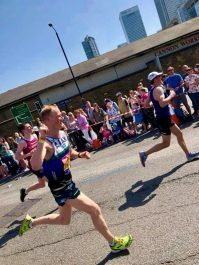 Once I had dropped off the pace, my thoughts soon picked up on the lack of a time to chase and, instead, I eased off the pace and made the most of the immense support and atmosphere along the remainder of the route to the finish. I didn’t feel defeated and there was no sudden wall I hit! At an easier pace, I remained focused on not stopping running the rest of the way. There were runners in all kinds of states who had succumbed to the conditions and wobbling about. I was no longer looking at my watch and kept myself moving to the finish. Mile 23 and the final stretch towards the finish. It was a relief to see the finish line and enjoy the last bit of the Marathon down the Mall and then to cross the line and receive my medal in a time of 3h18m38s. It was nice to see a couple of familiar faces who were staff working at the finish, ushering us through to collect our T-Shirts. I wasn’t my usual chirpy self, having left everything out on the course and not really recovering. Afterwards, I went straight to find a shady tree in St James’s Park for a well earned rest and an hour’s sleep. Sharing stories at the evening club Social. I am really pleased with my efforts from the day, having given it my best shot. 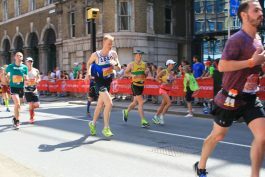 The conditions were not ideal for me to run a fast time and, as soon as I knew that my PB attempt was over, I focused on enjoying the rest of the race. I will save the big sub 3 effort for another day. I am sure I will be back but I will now need a plan B since I no longer have a Good For Age qualifying time to guarantee me an entry in to next year’s race. Trialling a NEW! 5 hour Challenge Category instead of the Experience for this one. Event Date: Sunday 15th April, Registration from 08:30am, Start 10:00am. 07:30am for Challengers. Facebook: Effingham event page, TBC. Participant Email: a link will be posted here closer to the event. Arriving by train: Effingham Junction is closest‎. Details: 5h Challenge and Sprint Adventure Events, enter as Solo or Pair. The Trail event is Solo entry and there is also a 2 hour solo MTBO Category. Challenge Event £40, £45 OTD – 5 hours, navigate to as many checkpoints as possible within the time. Enter more than 2 weeks before and pay £35. 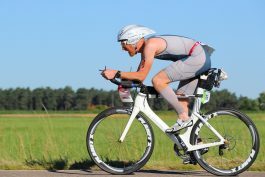 Starting on foot or bike, there will be one transition allowed. 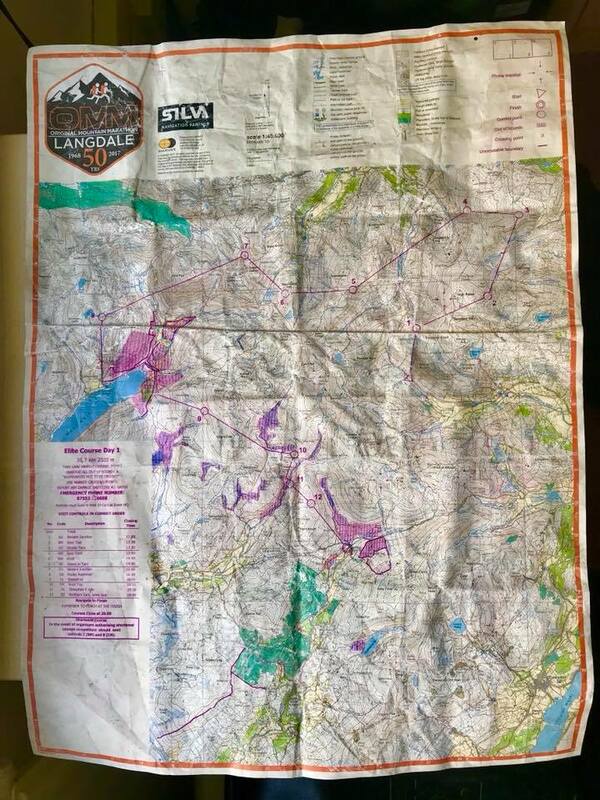 The maps given out at Registration will have 20 Checkpoints marked on each side, the values of which will be given out when you start. There will be 5 valueless checkpoints on each discipline. Sprint Event – £25, £30 OTD – 2 hours, navigate to as many checkpoints as possible within the time. Starting on foot, there will be one transition to Mountain Bikes. Enter more than 2 weeks before and pay £22. 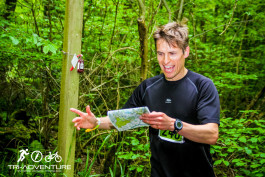 Trail Adventure Event – £23, £27 OTD – Trail Run only, navigate to as many checkpoints as possible within the time. Enter more than 2 weeks before and pay £20. MTBO Adventure Event – £25, £30 OTD – 2 hours, ride your mountain bike and navigate to as many checkpoints as possible within the time. Enter more than 2 weeks before and pay £20. We look forward to seeing you there. We would also like to hear what you like about Tri-Adventure events and any suggestions you may have for future events. Bike Hire: Bikes can be hired in advance and delivered by our Bike Partner B1KE. The cost of this service is £30 per event and includes a helmet and drinks bottle. More information about hiring a bike can be found here. To hire a bike, please send us an Email at least 4 days before the event. Test your navigation and strategy with this off-road adventure. 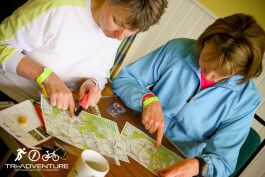 Using a 1:25,000 OS waterproof map which we provide, navigate trails and hills on foot and bike to collect as many check points as you can in the set time. 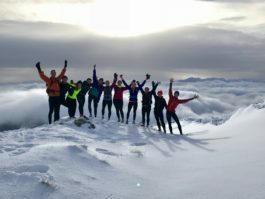 New to Adventure Racing? Watch this short informative clip. Visit the registration desk to collect your race pack and SPORTident dibber. Ensure you allow enough time to register. Have a read through event rules here. Mass Start on foot, with just one transition allowed on to the mountain bike. Using your map to navigate to as many checkpoints and cover as much distance as you can within the time limit. Please note that, on some courses there could potentially be mandatory checkpoints, these will be advised at registration. There will be a number of checkpoints to collect in any order set over a course. For Experience and Sprint events, competitors must collect a minimum of one run and one bike checkpoint to qualify. Checkpoint values will each be worth 10 points. Competitors will incur a penalty of 1 point per 30 seconds they are late back. After the event, download your dibber at the registration desk, collect your statistics and check the instant results service while enjoying a cup of tea/coffee and a biscuit. There will be the Tri-Adventure shop on the day selling merchandise and a few other essential items. Cash or card. 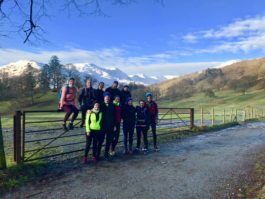 The 3rd weekend in January has seen me organise a Winter Running Weekend in the Lake District. This is the best time to go for an escape as it is officially the quietest weekend of the year for them up there. Many shops and pubs go through a refit but we were not up there for all that. We wanted to get out in to the mountains and go play in the snow! So, this year’s choice of accommodation was the Thorney How Bunkhouse in Grasmere. 11 intrepid ‘Chasers’ (Members of Clapham Chasers, my running Club down South) headed up on what was a glorious fab weekend. It had snowed all week but not been cold enough for it to freeze yet not be warm enough for it to melt away. That with it being a windless Saturday made for perfect running conditions and a very memorable weekend. 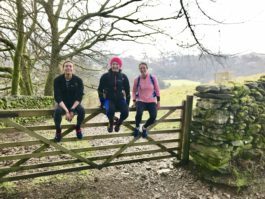 We covered 15 miles on the Saturday, taking in the Fairfield Horseshoe and afterwards returning to Grasmere from Ambleside via the coffin route. Great fun was had by all and I hope to put on more weekends in the future full of Adventure. The week between Christmas and New Year can be a bit unfulfilling after all the eating over the Christmas period. 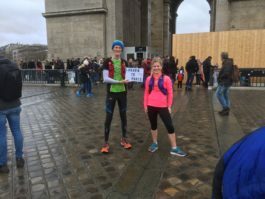 So, when a fellow adventure/running friend, Carla Molinaro mentioned that she was planning to run from London to Paris over the 4 days and asked if I was interested, hell yeh! and I jumped straight in. 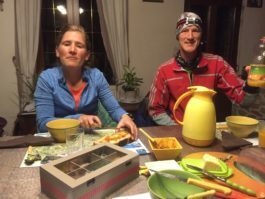 With the wealth of ultra running experience between us it was a straightforward job preparing from such a feat. Carla took it on her self to organise all the logistics of this 4 day adventure and to reach out and see if anyone else was interested. She roped in her dad to offer some crew support en route. I did as much research as I could to learn about the route and what it would involve. A big 60M first day from London to Newhaven in time to catch an 23:00 night ferry across to Dieppe in France to continue our journey. 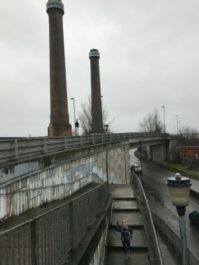 There is a lot of information on-line about the cycle route that is popular in the Summer, but funny enough, not so much about running the 168 miles. In France there is the ‘Avenue Verte’, the green route, which is an off-road, tarmaced old railway route used by the cyclists to complete the challenge. We had allowed ourselves 3 days on the continent to cover the remainder of the distance to Paris. I was happy to tick this challenge off as a bit of a jolly before the New Year despite my open focus being on running a fast 2h45m Marathon time in London in April. 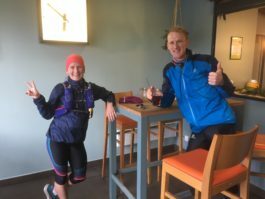 I knew keeping pacing sensible while getting the miles in, and looking after myself would not harm the progress I had made so far or prevent me continuing where I left off on my return. Next we had to come up with a Start and Finish point to mark the journey. Something like Tower Bridge to the Eiffel Tower, or Temple to Temple as these are both Underground/Metro station names shared between the cities. 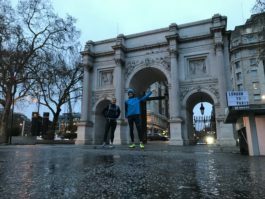 In the end we settled with Arch to Arc, which would see myself and Carla start at Marble Arch in London on the 27th Dec and finish at the Arc de Triomphe in Paris 30th Dec. We were all set. I would like to thank Alton Sports, for their continues support for my running adventures by having me as one of their running ambassadors and also for partnering with Tri-Adventure. It was great to run in my new kit which helped protect me from the elements en route. In December, 8am is dawn, which was the time we had arranged to meet and start our journey. It was a chilly and damp morning. Since I was heading in from Watford on the train, I arrived 30 mins early to allow time to take a couple of photos before we got started. I soon got cold and went underground to warm up as I was waiting for Carla to arrive. We were off at 8am and soon settled into a nice steady pace leaving a very quiet London as many head away over this period. The weather wasn’t going to change and we soon found ourselves in very wet and cold conditions heading into the wind. Carla’s gloves were wet and not keeping her hands warm anymore, so, a quick stop in a passing Decathlon sorted that out. I was carrying a live tracker so our progress could be monitored en route. This proved useful as half way along our route to Newhaven, Carla’s dad arrived in his car to offer his support the rest of the way to Paris. The tracker allowed him to see where we were so he could plan a suitable rest stop accordingly every 7/8 miles or so. We were also spotted from a car on the dual carriageway by an Ultra Running friend of mine, Cat Simpson. She was being dropped off at the station, but her dad then came and caught up with us for a brief chat and this pic. Heading up and over the North downs, we were greeted with snow and sleet, a well deserved hot chocolate break was on the cards in the next town, Godstone. After a brief break by a fire, Carla swapped her heavy pack she had been carrying for a much lighter race vest and from then on there was no stopping her. 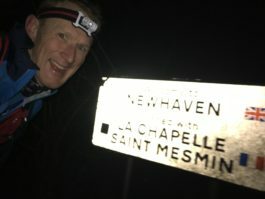 We both settled into our own pace and I caught up at various stops as we progressed to Newhaven. We still had a long way ahead of us and I was keen to keep the pace steady. We stopped for an Italian lunch in East Grinstead where I had a lovely Risotto. 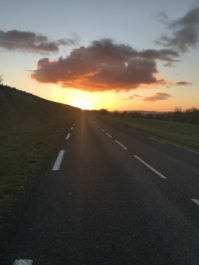 The route directed us on country roads and as I approached the South Downs, I was greeted with the most beautiful sunset during a break in the clouds before entering the dark stage. Day 1 finished at Newhaven Port at 19:45 with plenty of time to catch the 23:00 ferry from there. I actually finished with a bit of a bad stomach and struggled to eat my carbonara that evening. I had lost my appetite, but I wasn’t too worried. I felt fine and thought the rest/sleep on the ferry would sort me out. The ferry crossing was a quick 4 hours. Carla had organised a cabin for the 3 of us to maximise the rest we could get before starting on our second leg of the run off of the ferry at 5am. Another long tough day which started at sea level and kept going up all day! The original plan was to stick on the ‘Avenue Vert’ cycleway (disused railway) which I initially did, but the going was tough in the pitch black and I was away from the support. Carla had the better idea to stay on the lit D1 and made faster progress. I soon diverted back on to the road. It was all uphill and to add there was snow in some pretty cold conditions. Had to keep moving to keep warm. After the early start, we pushed on through for the 45 miles to reach the Gite in the early afternoon to get our first proper well earned rest before dinner was served at 7pm. The forecast for us today was not looking good. Strong headwinds, rain and freezing temperatures was going to make the planned 50 miles we had ahead of us tough. On top of that we had the pressure to get to the next Gite in time for evening meal at 7pm, pretty much before it gets dark. After a good nights sleep and some time to recover, we were out of that door back on it after breakfast at 07:30, It was going to be running in the dark for the first hour. To cover 50 miles in 11:30 hours was no holiday! Breakfast was bread and coffee at the family kitchen table. 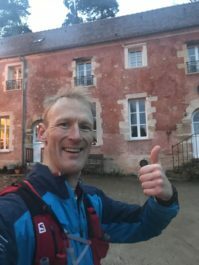 The forecast was correct and it was a very wet day and the decision was made to use google and take a more direct route towards Paris than to follow the Avenue Verte, which saw us on busy trick roads in wet and windy conditions but allowed us to make good progress towards our next Gite. Google maps threw up some surprises, it took me off the roads and through muddy fields and tracks. Luckly these trails were not busy as I managed to drop my iphone out of my pocket (my only form of navigating and communication) and noticed 5 minutes later when I needed to check my direction. Luckly upon retracing my steps, I found it face down in a big muddy puddle and can confirm that the 7+ is waterproof. The trails actually came as a welcome break from all the road pounding we had done and I only discovered afterwards that Google had taken me and Carla on different routes, but we still managed to arrive within 5 minutes of each other after many slippery miles in the mud. Arrived the end of day 3 before nightfall which was a great relief. Big day done. After another 7am alarm call for breakfast, it chose another early start to capitalise on the nice weather forecast the morning had to offer. Only 18 miles to do on this last day and we were keen to get them done. The goal was in sight as the initial muddy trails developed in to sub-urban towns and highways. It was interesting to see that the route would see us cross the Seine 4 times before hitting the Arc de Triomphe. We set off together at quite a pace, neither showing the effects of the miles we ad done. Once the route took us out of the farmers fields we bumped into Carla’s Dad again. Carla made the wise decision to change into some dry socks and trainers for the remaining road section and waved me on to continue. I entered the maze of roads that made up Paris with Google as my guide, keep me going in the rough direction. I was counting down the Ks as physically I couldn’t see the end goal. It wasn’t until the last 2 mins I saw the big Arc de Triomphe at the top of the road as it bent round. It was such a relief to see and I noticed on my watch that today’s run time was on 2h54m! my brain took over as it shouted out to me to finish under 3 hours for the 18 mile run in. Having not been to the Arc de Triomphe before, I was unaware of the tunnel under the 25 lane roundabout that circles it. Instead I ran straight across this busy roundabout dodging cars from the left and jumped over some crown barriers to the safety inside the middle. 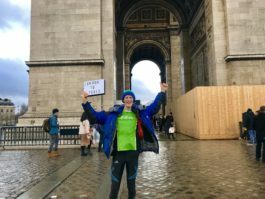 I continued to run and touch the Arc as a symbol of completing the challenge fully expecting Carla to have already been there having taken a different route in. My actions had raised alarm to the local armed police who came over to see what was going on. Fortunately by now I was having a photo taken by a tourist with my light box message and I think the police chose to not get involved and left me alone even though I had ended up jumping in a paid for area. I learnt this as Carla’s Dad was in there having bought a ticket and believe Carla was queing up for a ticket below. Carla is a phenomenally strong athlete setting such a pressing pace day after day. Amazing to see and a big thank you to her for suggesting and organising this challenge to make it possible. Also, a thanks to the super support on the ground by Carla’s Dad, Alfie. Alphie also drove us back home to the UK afterwards. Thanks so much! Also, thanks for all the comments coming through on Social media while we were en route. They made a great read and motivator in the evenings while we were drying out. Looking back, this was a tough challenge, a real adventure in the winter conditions we experienced. It was extremely fun (type 2 fun), and a great sense of achievement experiencing the ultra buzz again. 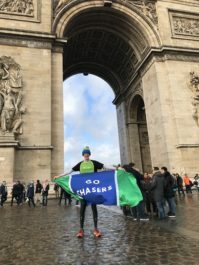 Proud to have packed the Chasers Flag to have at the end. A classic! in front of the Eiffel Tower afterwards. 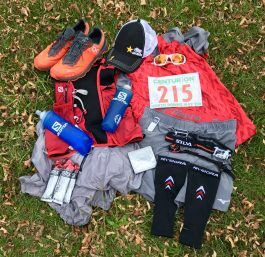 Again, I would also like to thank Alton Sports, for their continues support for my running adventures by having me as one of their ambassadors and partnering with Tri-Adventure. Alton Sports have 4 shops in and around Surrey. Check them out as they have a fab range of gear which is all available on-line. 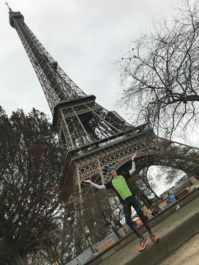 The comfortable gear I ran in to Paris was all from them, bar my Tri-Adventure Top of course. Link to fly-by routes on Strava. I met up with Carla at 7am at North Greenwich Station with the plan to run between the 5 Paddingtons. This is a Half Marathon (Just over 13 miles) journey visiting the 5 Paddington locations. It took me 2h35m. Here is our story in a short youtube film, please remember to subscribe. The end of October is often associated with Halloween and when the clocks go back… for a hardy few, it marks the annual staging of the OMM Mountain Marathon, a notorious two day team navigation challenge in a mountainous environment in often tough and challenging conditions. Competitors are completely self sufficient, carrying everything on their backs. 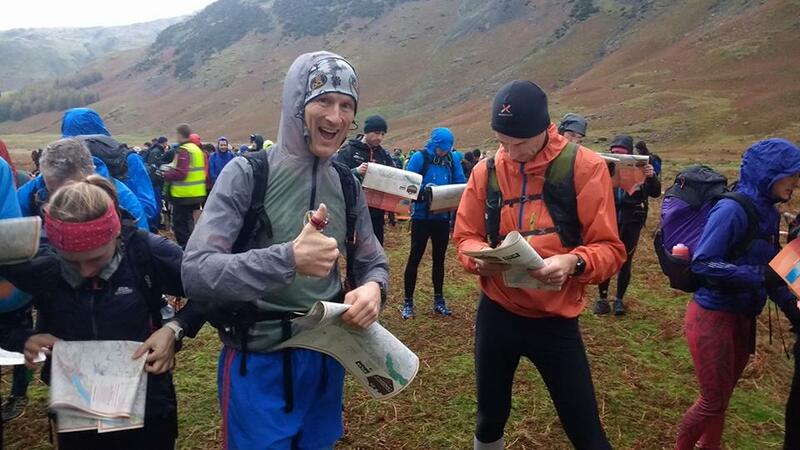 This was a special bumper year and attracted a strong field as OMM was celebrating its 50th edition of this event by returning to the Langdales in the Lake District. The first challenge is to find someone willing enough to team up with; someone who is of equal standard, and used to the harsh environment and terrain, so that you can work together and efficiently navigate through the course. There are 2 types of events at the OMM, which attracts 2000 competitors. A short, medium and long Score event, where competitors have to maximise points from the checkpoints visited within a set time, and those with the highest points are the winners (a bit like our Tri-Adventure events). Then there are the Linear courses increasing in the degree of difficulty – C, B, A, and Elite. These see competitors visiting the Checkpoints in a set order with the quickest being the winner. 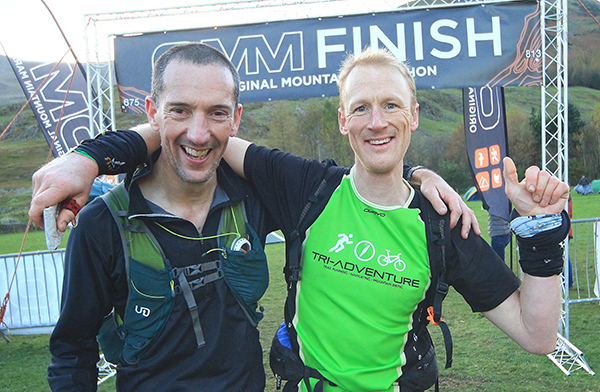 I was keen to tackle the OMM Elite course again, as I believed the potential was there for me to achieve a top 10 place, having been placed 14th with Kev Honeysett a decade ago, at the 40th OMM. This time, I paired up with a long standing mate from my Adventure Racing days, Dave Spence. I was pleased with this pairing as I had raced with Dave before about 8 years ago and it had worked very well then. 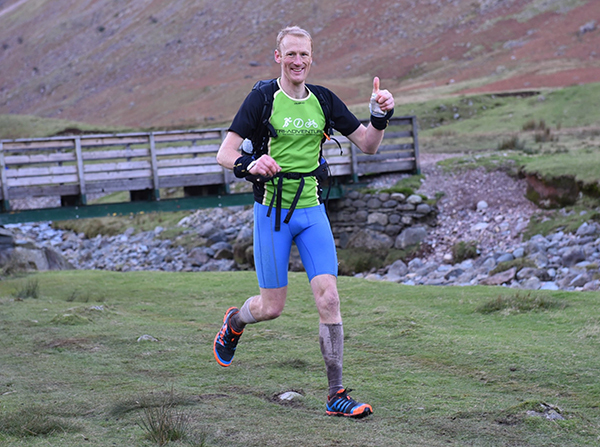 Dave is also based up in the Lakes, which made it easy to convince him to get involved with another OMM. I caught the train up from London during the day on the Friday to go through final prep and get registered ahead of our start window early on the Saturday morning. We stayed in the van at the venue the night before the event. Saturday morning, we were greeted with strong northerly polar winds and low level cloud, making for some claggy hills, with some rain thrown in there as well for good measure. Most would say typical OMM weather, with low visibility and definitely one for the navigators. 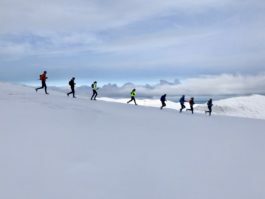 Those who are fast Mountain Runners, or those who struggle with navigation would prefer clearer and brighter conditions. At 08:30 we were off on our Elite Adventure and, in true OMM form, we were sent straight up a steep hill to the first of 14 checkpoints. We soon settled into our rhythm and pretty much maintained that during the course of the day. There were faster teams around us, but we kept bumping into them as they made navigation errors in the conditions. We carefully navigated ourselves through the course. The only pressure was to make it to the overnight camp by the 20:00 cut-off. There were some challenging features to find where the checkpoints had been placed which took all of our navigation skills to locate. As we neared the end of the course, it became clear that we would not make it to camp before dark. I think all competitors in the Elite Course had a tough day with many throwing the towel in, knowing they could not make the cut-offs in these conditions. Even the leaders were 2 hours slower than an average OMM day 1. The course planners had really set a high mark which saw 78% of Elite teams, and 90% of A class, not complete day 1. 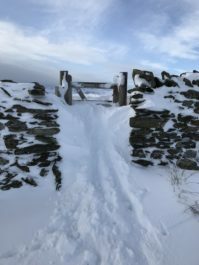 I put this down to the constant ascent and descent everyone had to endure to cover the distance over some very tough uneven Lake District terrain. We were, however, still in it and arrived at camp an hour after dark having spent 10h36m on the hill. Much to our surprise, and thanks to our efforts, we found that we were in 9th position out of 10 finishers! The course was still open for another 20 minutes, during which time another team, who started behind us, could have bumped us down, but we couldn’t wait around as we had camp to set up in a cold boggy field. We put up our small Terra Nova Photon tent, which would protect us from the elements overnight and allow us to dry out, change into our spare kit and cook a hot meal before sleeping and resting. 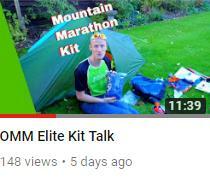 With mountain marathons, weight is a key part of a team’s efficiency, so, lightweight balloon beds are used to insulate ourselves from the ground (see the youtube link below), and 1 season sleeping bags are used, offering marginal insulation from the cold air. The OMM is never sold as the most comfortable night’s sleep on a Mountain Marathon, but I did actually sleep straight through to the Camp Alarm call at 6am the next morning, bearing in mind that the clocks went back during the night, giving us that very welcome extra hour. 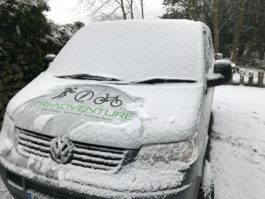 Day 2 was a complete contrast to the conditions experienced on Saturday. Sunny blue skies greeted us, which was a great relief, as it allowed for faster movement over the dryer ground than the day before. 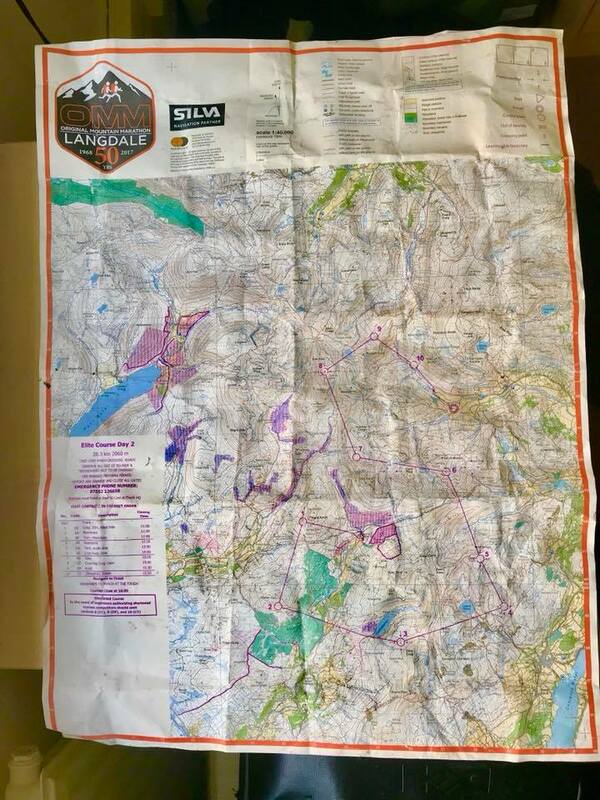 A new map was handed out at the start, with a course plotted to take us through 10 CPs, one of which was the Charnley Crag Cairn, a memorial cairn to Gerry Charnley, the original founder of the Mountain Marathon. We found ourselves still in 9th position out of the 10 remaining teams and, with the better conditions, we could see the other teams around us, which was uplifting, as we jostled for position and route choice throughout the day. The time pressure had not eased though, as there was a tight 16:00 course closure in place, which kept us pushing right to the end. It was a bitter cold day, the type where your fingers stop working. This made it difficult to get into the zips to get at the food on the go. We knew, however, that if we could finish day 2 before the cut-off, we would have earned a well deserved top 10 spot! We arrived at the finish drained and exhausted after another long 7h51m on the hill, to finish with 30 mins to spare. The picture below was taken just after we had crossed the finish line and just before we had found out that we had gained a place to finish in an astonishing 8th position in the Elite field. Dave and I worked really well as a team. It is an important quality to have a partner who is able to look after themselves in the tough conditions. This includes a sound clothing layering system and staying fed and watered. There was plenty of drinking out of streams en route to minimize the weight carried on our backs. Also, the ability for us to both navigate at a high level in the clag allowed for discussion on route choice and each of us able to keep tabs on where we were. It was a pleasure to race with Dave in, what I believe, to be my best result to date. There was a lot of discussion on various platforms afterwards about whether the 50th OMM Linear courses (Elite,A,B,C) had been set beyond most people’s abilities. There are bad weather options available to the the organisers to adopt, if necessary, but these were not implemented. 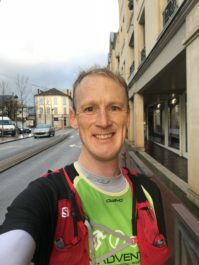 In my opinion – The OMM has a reputation for being extremely tough, set at the end of October in mountainous environments. We know what we are letting ourselves in for. As strong navigators, and perhaps not the fastest of mountain goats, clag and low visibility is our dream ticket. Yes, the course was tough this year and noticeably longer over tough terrain, made worse by the weather we encountered. But this suited only a small handful of competitors who rose to the challenge. Some teams perhaps stepped up a class for this 50th edition or returned after some absence and found it really tough going to then reach the camp within the time cut-off. Not forgetting, OMM is a business and in this social media world, I am sure they would have liked to have seen more happy completers who will be back for more, rather than the large proportion of DNF’s in their linear courses. I hope they don’t make the courses easier in future years to improve the ratios. 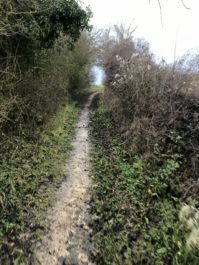 Given the conditions at hand, a choice of a shorter linear course option, at the start line may have tempted many to go for a safer option to complete the OMM. Those who were psyched up to take on the full course could go and battle it out. I am sure I will be back for more as I love these type of events. 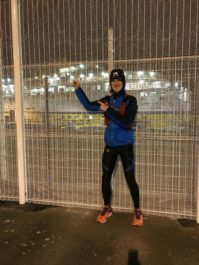 Running Shorts – Blue 2003 London Marathon Shorts! Can Virtual Reality Provide an Authentic Biking Experience? It is fair to say that many of the technologies we only dreamt about 20 years ago are now becoming a reality. Take for example the box office success Tron. How many people thought it would be cool to ride a virtual reality computer bike? Now you can, and not only ride one, but ride a bike that replicates a mountain bike travelling across varying terrains. Using a combination of a real bike and some smart software that recreates the actual experience of pedalling on rough terrain, a company called Mindgrub has developed an Oculus Rift-ready virtual bike. The centre of the virtual reality bike is an Arduino board, which is built with reed switches that open and close to recreate actual biking in cyber space. The technology is able to measure how fast the wheels are spinning, which is directly fed back to the screen that the user is viewing. The experience is made more natural thanks to the magnets that are installed on the physical bike. The magnets make sure that the pedalling motion is in sync with the real movements of the wheel with the timing of the virtual bike. Without manipulating the bike, users would be passing through walls or hovering over rivers. Steering Mindgrub’s virtual bike present hazards just like in real life. In order to make steering realistic, the virtual bike uses micro-switches on the frame to facilitate right and left turns. In addition, pieces of equipment called potentiometer and variable resistors were attached to the handlebars to create friction when braking. 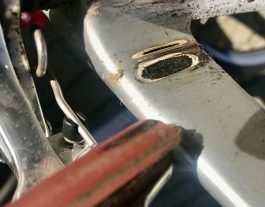 An aluminium bracket is responsible for engaging a few rubber bumpers, both of which are attached to the neck of the bike to allow movement for steering while the user is wearing the Oculus Rift headset. Unity’s Uniduino, which is commonly used for powering Oculus Rift demos, was a key component for making the VR bike more immersive. It was the same technology used in creating Tomb Raider VR when it was first unveiled in 2016. The Tomb Raider VR title was a massive success thanks to its seamless integration with the Unity engine. The game’s VR version was a direct result of the global appreciation for the film franchise that made its bow through a videogame back in 1996 and then reached the silver screen in 2001 when Angelina Jolie brought to life Lara Craft for the first time. Since then the franchise has created Tomb Raider slot games as well as a number of other videogames and there will be a new movie out in 2018 starring Alicia Vikander as the fearless Croft. Tomb Raider’s use of the Unity engine is proof that the platform works, and Uniduino helps tremendously with setting the right mood for the games. After using a pre-constructed city from the Unity 3D Store, Mindgrub was able to create a virtual city modified to give an authentic biking atmosphere. 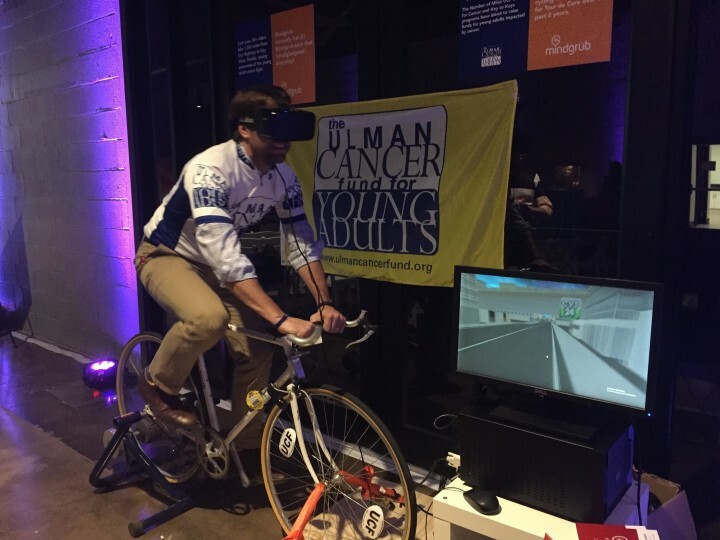 Posted in Uncategorized	| Comments Off on Can Virtual Reality Provide an Authentic Biking Experience?